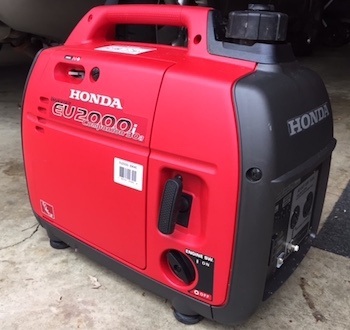 The EU2200i from Honda came in first place in our best portable generator competition. The unit offers reliability and performance that is unsurpassed in this category. While it has a higher price than many of it's competitors in this price range, the quality of Honda's parts and the VAST network of certified Honda repair shops around the country make this a no-brainer when it comes to a RELIABLE backup solution. That said, the EU2200i is one of the most reliable inverter generators on the market. If you're a fan of Honda (and we are) you should take a close look at this model for your next purchase. First thing let's dig into the specs on this unit. The EU2000i is rated at 2000W peak power with a rated output of 1800W. Basically this translates into an always available 1800W with the capability to handle spikes up to 2200W. Spikes generally occur when something like a refrigerator turn on as they require more current to start up. The GX100 engine comes in at 98.5cc, making it one of the largest in it's class. Why is this important? Well, the larger engine allows the Honda to handle larger loads (say over 1000W) with little trouble. It also handles peak loads (startup/inductive loads) more gracefully which means less tripping of the protective circuitry. A simple recoil pull is used to start the generator. It is specifically designed to be easy to pull so that anyone can quickly and easily ​fire it up with one pull. Even with the larger engine the Honda still only weighs in at 45lbs (without fuel). Speaking of fuel, the capacity is just under one gallon. This allows for a run time of about 3.4 hours at full load (1800W) and about 8 hours in "Eco Throttle" or about 25% power. In terms of noise the unit comes in at 59dB at it's rated load and quiets down to 53dB in economy mode. 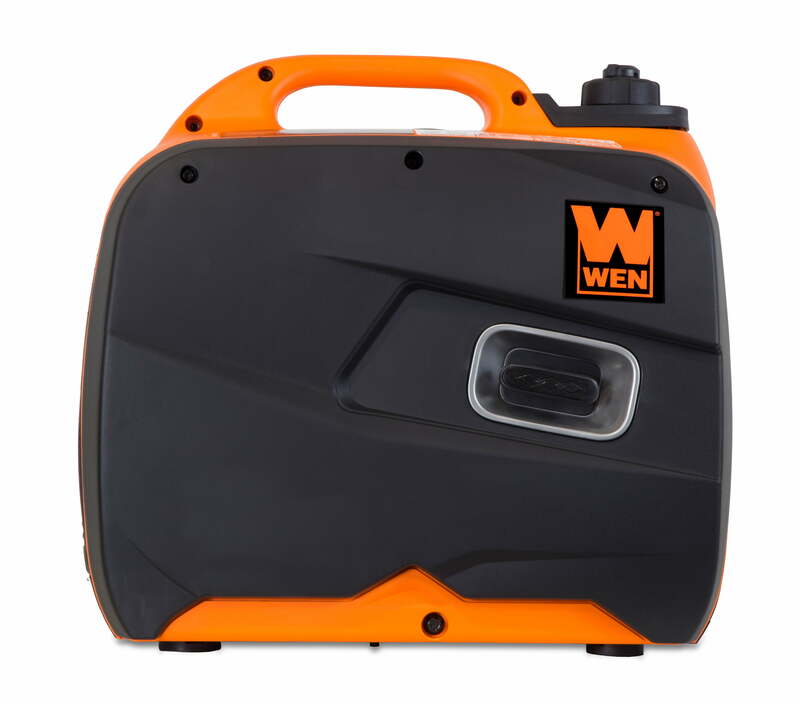 This makes the EU2200i an ideal generator for camping. You'll get no complaints from your neighbors when this guys running. 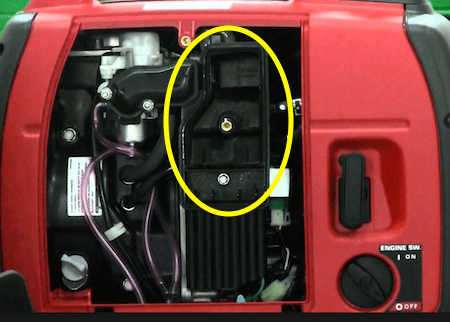 Honda also makes an EU2200i called the Companion that includes a 30V outlet for hooking up directly to your RV. It can be paralleled together (using a separate pairing kit) with the standard model, effectively doubling your power output. As it turns out, while we were reviewing the EU2200i inverter generator we lost power for the better part of a day in our neighborhood. This gave us an excellent opportunity to test out it's capabilities in a real-world environment. Let's start with the basics. As we mentioned earlier the unit weighs around 45lbs. The contoured handle along the top is comfortable and great for carrying. The plastic shroud covering the unit is sleek and allows for easy transport without it banging against your leg as you walk. Startup was a breeze. Our unit came to life with one gentle pull of the starter. We switched on the Eco Throttle and it just hummed along. The noise level was imperceptible from inside the house just a few feet a way. About the only time you could hear the unit was when the refrigerator kicked on and the Honda had to throttle up to handle the additional load. Once the fridge was running the Honda immediately dropped back into Eco mode. Other than the fridge we hooked up a handful of lights and a few other low wattage devices. Thankfully (since we had no TV) the inverter based technology also allows you to safely charge sensitive devices such as laptops, phones, and tablets.​ If you're looking to power more than just a few necessities, check out these standby generator reviews. The gas tank is accessed from the top of the unit as shown in the picture to the right. This makes refueling pretty easy, even when the unit is running. 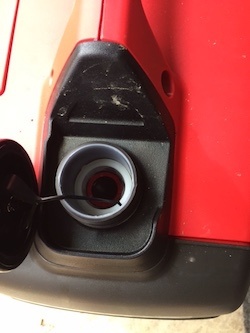 There's a very convenient reservoir around the opening so that any fuel that doesn't make it into the tank won't run down the side of the generator. Unfortunately there's no fuel indicator so we were stuck opening the fuel cap and using a flashlight to check the level. During our tribulation (which lasted all of 7 hours) we didn't actually need to refuel the unit. We did add a bit extra shortly before the power was restored as a precautionary measure. Maintenance of the EU2200i is pretty basic. Essentially it needs oil and gas to run. There is a low oil indicator on the front panel that lights up when levels get too low. Adding or replacing oil requires removing the side panel to access the oil reservoir. Once the panel is removed simply remove the dipstick and pour out the old oil. There's even a nice spout beneath the reservoir to keep oil from dripping into the engine compartment. Using a funnel you can add 10w30 oil until the reservoir is full. The air filters are located within the same side panel as the oil. To clean them simply unscrew the cowl covering the two filters. Pull the two filters and wash them in the sink to remove any dirt. Use warm water and a small amount of dish soap. Make sure to rinse them thoroughly. Next you'll need to soak the two filters in oil before placing them back into the generator. This can be done using ziplock bag. Pour in some oil and then drop in the filters. Seal the bag and squeeze the filters to ensure oil impregnates the entire filter. Then remove the filters and blot them on a rag to remove excess oil. Don't skip this step as too much oil in the air filters will cause the engine to smoke when running. Next wipe the air filter housing with clean rag to remove any dirt that has accumulated there. Then place the air filters back in place. Make sure the rubber gasket on the cowl is properly seated to allow no air to leak through. The EU2200i has a 3 year warranty that covers both parts and service. Simply take the generator to an authorized dealer in your area and they will handle the diagnosis and repair. One of the biggest benefits of buying any Honda product is their impressive network of repair facilities. You're likely to find one in just about any city or town in the U.S. This can be especially important when traveling in an RV or camper. The Honda reputation for quality makes it easy to sleep at night knowing you've got a product that can offer power in an emergency and has the dealer network to back it up should something go wrong.